Using the right HTML elements when implementing forms is essential to ensure they can be used by as many people as possible including screen reader users. In this blog Léonie explains the correct usage of the fieldset and legend elements. On GOV.UK we often use groups of related form fields, like a set of radio buttons or checkboxes. These related fields might be used to offer multiple answers to a single question, or to ask for multiple pieces of information about the same thing. The question and answers are linked visually, but must also be linked programatically. In this example the question sits above the set of radio buttons, and visually it is clear that the question relates to the group of form fields. If you cannot see the page, this relationship is lost however. If you use a screen reader to choose one of the radio buttons, you will hear the form labels being announced ("Yes" or "No"), but you may not hear the question announced at all. This is because the question is not associated with the set of radio buttons within the code of the page. Quick recap: screen readers get most of the information they need from the HTML code of the page. The browser takes the HTML code and converts it into accessible information that can be used by assistive technologies like screen readers. This article on Accessibility APIs: a key to web accessibility has more information. If you use the arrow keys to guide your screen reader through the form you will hear the question announced. This is not an efficient way to navigate through a form though, so most screen reader users choose to use the tab key instead. But it is when you use the tab key to navigate through a form that the question is not announced - making it difficult to know what the correct answer might be! We fix this by using the <fieldset> and <legend> elements. These elements work together to tell screen readers that a group of form fields relate to each other, and to provide a label for the group. All of the related fields go inside the <fieldset> element, and the <legend> element is used to represent the question instead of the <p> element. Now when you use the tab key to navigate through the form, your screen reader will announce the question before it announces the first field in the group and its label. 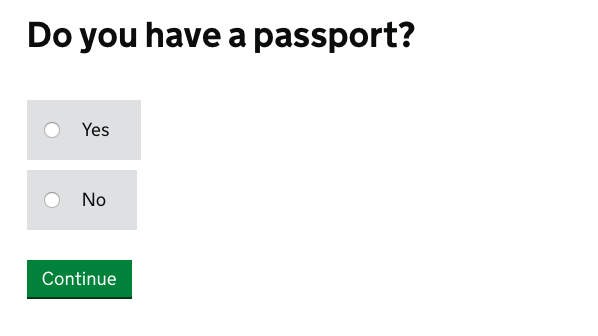 So in our example you hear something like "Do you have a passport? Yes, radio button". Note: when used with Internet Explorer, the Jaws screen reader will announce the legend for every field in the fieldset (not just the first field). This is not the expected behaviour. The <fieldset> and <legend> elements are also used when there are multiple questions about the same topic. It is possible to nest one <fieldset> element inside another, but it is not recommended. Screen readers do not automatically indicate the end of the <fieldset> element, so it is impossible for screen reader users to confidently know which fields belong within which fieldset. You have a single multiple choice question (using radio buttons or checkboxes). You have several questions relating to the same topic (like text boxes, or any other type of field). You have a single form field that asks for a single piece of information. When used correctly, the <fieldset> and <legend> elements tie related form fields together in a way that is accessible to people who cannot see the visual layout of the form. Follow @LeonieWatson on Twitter and don't forget to sign up for email alerts. In your demo page the problem, it seems with the nested fieldset is that the "Phone" field comes *after* the nested fieldset. 1. Is that the only problem with a nested fieldset to your knowledge? b) if so, does it work like this in the wild? It uses two fieldsets to organise time choices. The first legend is "date and time" and the second legend (for which there are multiple) is, for example, "Monday 23 October". "1. Is that the only problem with a nested fieldset to your knowledge?" So as a screen reader user tabs from field 4 to field 5, they are given no indication that the inner fieldset has ended but that the outer fieldset remains open. Similarly when focus moves from field 5 to field 6, they are given no indication that the outer fieldset has closed either. b) if so, does it work like this in the wild?" No, screen readers don't concatonate the legends. Only the legend for the parent fieldset is announced. So in this example, when focus moves to field 3 the "Group 2" legend would be announced, not the "Group 1" legend. That leaves me with one remaining question. In my demo, all radio buttons are inside the inner fieldset. There are no radio buttons inside the outer but not the inner fieldset. I hope that makes sense. In this case, and in my demo, does this mean it works well? "In this case, and in my demo, does this mean it works well?" The fieldset problem for screen reader users isn't an issue for your form, no. The expected behaviour is for the legend to be announced when focus moves to the first (and only the first) field inside the fieldset. The "first" field changes though, depending on the direction of navigation. It also changes when there is a set of radio buttons inside the fieldset and one of them is selected. Take a fieldset containing a set of five radio buttons: we'd need to put aria-describedby on the first radio button, the last radio button, and either dynamically add it to whichever radio button was selected (assuming it wasn't one of the two radio buttons that already had aria-describedby applied) or apply it to every field just in case. This would fix the VoiceOver/iOS bug, but it would also cause every screen reader to announce the legend for every single field inside the fieldset. That's a lot of extra verbosity, for a lot of people. That extra verbosity though -- that's already the case for JAWS/IE users, as you noted. And since JAWS/IE is a majority of screenreader users, maybe that's an argument for saying that using LEGEND/FIELDSET creates an overly verbose experience in general? It would be good to do some research to find out whether this behaviour adversely affects usability for Jaws + IE users, before imposing it on other groups of people. It's amusing that your one no-no is using a fieldset for a single question, yet your core example in the article is a single yes-no question. Surely there are other tools (such as the "title" attribute) which you could use for accessibility. Anyway, for a single question it's easier to just have answer buttons rather than radios with a separate "submit" button. I probably didn't phrase it that well. The fieldset/legend elements are not needed for a single question where the question is contained within the label for the field. The title attribute wouldn't be appropriate in this case. It forms part of the accessible name computation, and so if present it effectively overrides the label element. The title attribute is also not <a href="https://www.paciellogroup.com/blog/2010/11/using-the-html-title-attribute/">particularly accessible</a> for other reasons. It would be possible to use buttons, but buttons do not toggle on/off like radio buttons do. You'd need to replicate the radio button behaviour so that only one button could be selected at a time. You'd also need to provide additional semantics to inform screen reader users which button was currently pressed. Recently did some work on making a web form accessible and this really caught me off guard, as the `radio` and the `checkbox` controls did not have any surrounding `fieldset` and `legend`, and there was no context to the `input` controls from a voiceover prespective. It's good to see documented here. How do you guys normally debug accessibility issues, is it just trial and error? Glad this post was helpful! We try to follow standards as much as possible. For example, if there is an HTML element designed to do the thing we want, we'll try to use it. The theory is that browsers and assistive technologies also try to follow standards, so it should give us some common ground. In real life there are always differences between browsers and assistive technologies when it comes to accessibility (as with everything else). We encourage usability testing with people who use assistive technologies, as a way to uncover potential problems. Once an issue has been identified, it's a matter of trying to find the cause, and from there of trying to find a solution that fixes the problem without having a negative impact on someone else's experience. If you work inside UK Gov, I recommend joining the Accessibility Community Google Group. Otherwise, the A11y Slackers Slack/Gitter channel is another good place to talk about technical accessibility with other people. Wonderful post - I never even thought of this, shamefully. Thank you for sharing and making the web a better place!